Credit: Reproduced from R. Samuel et al, Proc Natl Acad Sci U S A. 2013;110:12774-9. Individuals with heart disease, diabetes, and non-healing ulcers (which can lead to amputation) could all benefit greatly from new blood vessels to replace those that are diseased, damaged, or blocked. But engineering new blood vessels hasn’t yet been possible. Although we’ve learned how to reprogram human skin cells or white blood cells into so-called induced pluripotent stem (iPS) cells—which have the potential to develop into different cell types—we haven’t really had the right recipe to nudge those cells down a path toward blood vessel development. But now NIH-funded researchers at Massachusetts General Hospital in Boston have taken another step in that direction. This team has developed a technique to reprogram cells taken from adults into iPS cells and then identify which cells have the potential to develop into functioning blood vessels. When they selected cells displaying three particular proteins on their surface, these precursor cells could develop into the cells that line blood vessels. 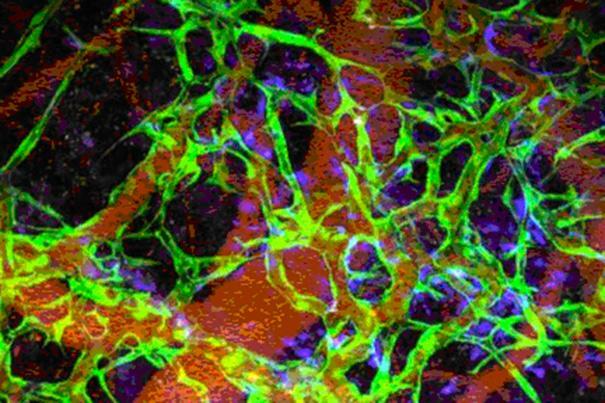 When implanted into mice, these cells developed into a network of blood vessels that functioned for more than nine months. The team showed that it was also possible to reprogram adult cells taken from individuals with type 1 diabetes and use these cells to produce functional blood vessels. It’s an encouraging milestone for using regenerative medicine to treat vascular diseases—and a step toward engineering entire solid organs. Generation of functionally competent and durable engineered blood vessels from human induced pluripotent stem cells. Samuel R, Daheron L, Liao S, Vardam T, Kamoun WS, Batista A, Buecker C, Schäfer R, Han X, Au P, Scadden DT, Duda DG, Fukumura D, Jain RK. Proc Natl Acad Sci U S A. 2013 Jul 30;110(31):12774-9. I don’t think researchers should reprogram human cells — they lack the wisdom to know what is right for people and seem more and more focused on private profit, rather than public good. NIH has failed to see that average Americans have a say in what research becomes funded at NIH — I guess they are afraid of counterpoint and that medical researchers couldn’t stand up to views different from their own. But well we know the parallax gap of medical researchers — who like their colleagues in medicine believe that the public is not entitled to an opinion — after all the public is too ignorant to be heard on these matters — from their viewpoint.